Broken souls and prayers on wings! I've taken this series of pictures in the ground floor of the vestry, which used to stable the horses that brought people to the chapel in years gone by. 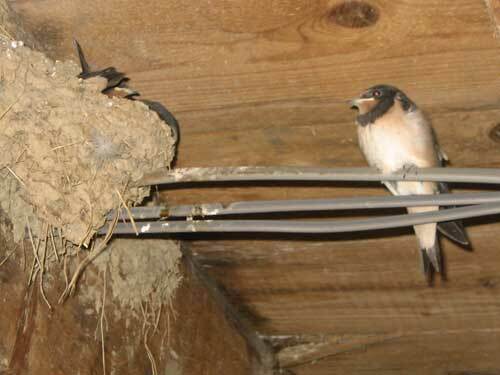 Almost every year the swallows come and hatch their young in the same nest where they were born. It has been incredible to document have fast they have grown. They were still in their eggs at the end of May! Yesterday morning in the chapel I was stopped by this verse in Psalm 119:20 that says, "My soul breaks with longing for Your judgements at all times." It seemed to capture something of what happens during times of prayer when things really get moved in the spiritual realms. The idea of our soul "breaking" may sound drastic, but I think it really means just coming to that place beyond ourselves where we know we can do nothing on our own! We are taught in life to try to do everything for ourselves, and our souls don't like to fail at it. And so this place of "breaking" runs against our nature, but it is exactly where we need to be for prevailing prayer. Paul states very clearly in 2 Corinthians 12:10 "... for when I am weak, then I am strong." He also says in Galations 2:20, ".. it is no longer I who live, but Christ lives in me;" And we are reminded again in 1 John 4:4, "because He who is in you is greater than he who is in the world." So we know Who takes over when our own soul is broken in prayer. As we look at the world around us and see how broken it is, that is when we can cry out for God's judgements to prevail. Every area of life in today's world is in desperate need of God's righteousness and judgment. Jesus teaches about the Holy Spirit in John 16:8, "And when He has come, He will convict the world of sin, and of righteousness, and of judgment." He is the only one that can bring change to a desperate world. Listening to the news of current world events is like looking at a tapestry of man's failures to manage the world's affairs. He can't manage his own personal affairs because of this failure to submit to the laws and judgements of our Creator. Even those of us who know Him must struggle with our human nature. "Help, Lord!" If you'd like to see how they managed to fit in the nest take a look at this video link. Watching the growth of these young fledglings - from hatching out of their eggs to young "teenagers" - is such a statement of God's amazing ability! It also seems like a great picture of how things can progress when we are willing to come to Him and live with "broken" souls - longing for His judgments to rule in our hearts, and our world, rather than the judgments and decisions of fallen man. When I went to the chapel yesterday morning I took this last picture, with the bravest of them out of the nest and perched on the wires. And this morning when I looked, they were gone. Probably out for their first flying lesson! All of nature is just filled with awesome reminders of God's power and greatness. Isn't it wonderful to know that when we come to Him in humble longing for His righteousness, our prayers can take flight to much greater heights than any other His creatures ever could! 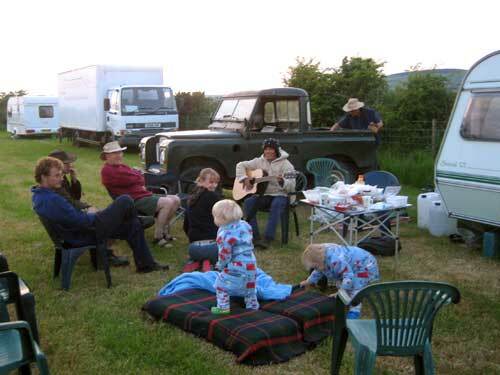 Last weekend we had a wonderful time camping out at the Mighty Men Cymru conference in a farm field in Pembrokeshire. 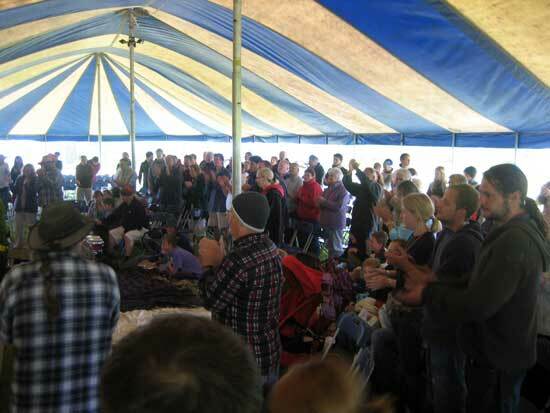 It was reminiscent of old times during the Jesus Movement of the 1970's, and the Festivals of the Son that took place in similar surroundings. Those were amazing days, when hundreds of thousands of young people came to know Jesus as Lord and Savior, and Christian communities sprung up everywhere. Those may have been the "good old days", but these are the "good new days" and we were so blessed to participate in this event. There was great worship, and some great preaching too, but for us the best was this thrown-together weekend community! We could drift from tent to camper and find God's love everywhere. The schedule was left intentionally loose to allow plenty of space for fellowship, and being able to spend time with people that we've only briefly met somewhere was a real privilege. I think the essence and value of community is actually having this kind of opportunity for building relationships. I'm sure that in my case and that of many others, it was full time community life that enabled us to become rooted and grounded in our faith as new believers. That constant contact made room for fulfilling the exhortation in Hebrews 10:24-25, "And let us consider one another in order to stir up love and good works, not forsaking the assembling of ourselves together, as is the manner of some, but exhorting one another, and so much the more as you see the Day approaching." When we read of the life of the early church, we see another glimpse of the value of close and frequent fellowship. Acts 2:46-47 says, "So continuing daily with one accord in the temple, and breaking bread from house to house, they ate their food with gladness and simplicity of heart, praising God and having favor with all the people. And the Lord added to the church daily those who were being saved." The fast-paced life of the 21st century makes it difficult to find quality times even for immediate family, much less fellowship with God's broader family. But it is so important that we make times of fellowship a priority, and so build one another up through His love. We are greatly encouraged as we see more of this kind of event happening. They provide wonderful opportunities for "Cross-pollination" (pun intended) through building fellowship between saints from different churches and backgrounds. We can discover that we are really one body in Jesus Christ, and members in particular - each with their own gifts and flavors to contribute to others. The different prayer activities we are involved in give us an ever-widening circle of acquaintances and friends, and we realize how wonderful a work the Lord is doing here in Wales in preparation for the coming outpouring. There is a healthy and growing Body of Christ here, with a growing hunger for His presence in their daily lives. Though we are not a great percentage of the population, the nets of relationship are being repaired, prepared and enlarged for the coming harvest. God isn't worried about odds or numbers. Remember just one of David's smooth stones was all God needed to bring down Goliath. How much more can he do with thousands of willing hearts and lives? We are now permanent residents in Wales!! Just a quick note to say "Thank you, Jesus!" Today we received our passports back from the Home Office with our permanent residence permits to stay in Wales. And also a big thanks to each of you for your prayers on our behalf. So now we can settle down to the task for the long haul and won't have to be concerned again about visas as long as the Lord has us here! The world and those who dwell therein."